Oarfish is reported to be the longest of all fishes and has a ribbon-like body. The fish has been known to be elongated but it is very rare to see such a long one. The large species are considered game fish and caught commercially; their flesh is not well regarded due to its gelatinous consistency. Oarfish are living deep under the water, it is difficult to catch and they are rarely caught alive. 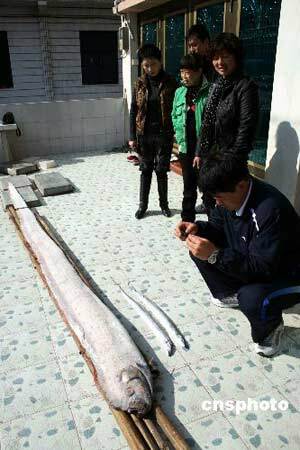 However, the record of the longest oarfish ever known was 15 meters long and 45 kilogram. This entry was posted on Friday, November 30th, 2007 at 10:14 pm	and is filed under Interesting Stuff. You can leave a response, or trackback from your own site.